I’m reaching a point where I think I have all of the dimensions nearing completion for the 3D version of the wheelchair but it’s difficult to get a sense of scale when it’s just a virtual model on a computer screen. With this in mind, I’ve decided to build a full-size model out of PVC pipe. Owing to the fact that this was the most important part that everything else needed to fit around, the first thing I wanted to make is the seat. To bend the pipes to the right shape for the seat, I filled them with sand which I’d baked in the oven, let them sit in front of the fire for a short while, then used rope to pull the pipes down into a wooden jig (see image below). Taking inspiration from recumbent bikes, I then cut out bits of foam to match Ada’s body – adding or removing foam upon Ada’s request. 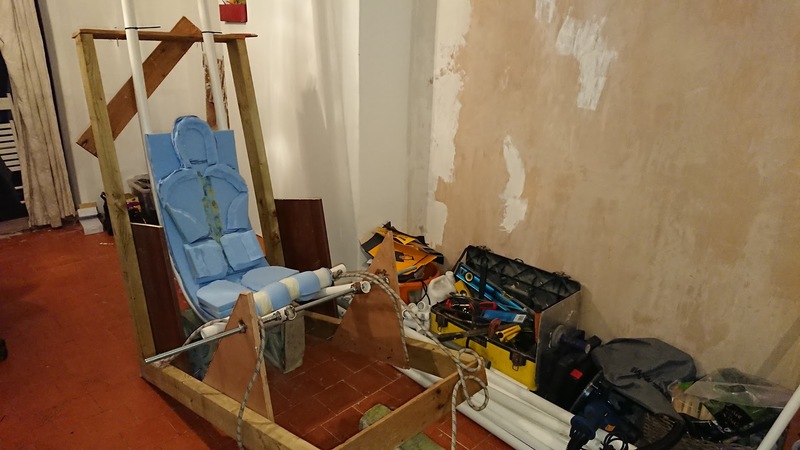 Mum is now sewing some material which can be stretched across the pipes to support Ada’s weight, and tomorrow, once the pipes have cooled down and settled into their new shape, Ada will be able to test the driving position of her wheelchair for the first time.